Be the first to share your favorite memory, photo or story of Warren . This memorial page is dedicated for family, friends and future generations to celebrate the life of their loved one. Warren Harold Muchow, age 91 of Altamont left this life on Sunday, April 15th. Harold was born on December 2, 1926 in Altamont, Il, the son of Wilhelm August Muchow and Alwina Katrina Klitzing Muchow. He had one brother, Norman Muchow and one sister, Viola Muchow Yagow. All proceeded him in death many years ago. Baptized on December 12, 1926 and confirmed on March 17, 1940, he married the love of his life, Shirley Slingerland Muchow on July 26, 1953 and they shared every joy and sorrow together for almost 65 years. He is survived by sons Kevin and wife Elaine of St. Charles, MO and children Ashley and Jonathan; Jeffrey and wife Debbie of Altamont, IL and children Mason and Cody; Scott of Springtown, Texas and children Krystal Akin (husband Ryan), Molly and Christian Muchow, daughters Susan and husband Scott Willms of Waterloo, IA and children Joshua (wife Kailah) and Hannah, Julie and husband David Easton of Mattoon, IL and children Tony (wife Patti), Laura and Abbie. Six great grandchildren; Dawson, Halli, Annaliese, Benjamin, Saoirse and Everly. Harold was a mentor to many. His wisdom as a financial advisor, sommelier, baker, gardener, singer, dancer, and world traveler earned him respect from everyone who was privileged to know him. A man of many talents, he always gave the credit for his many blessings to his “good Lord up above”. He and his wife Shirley raised their five children to love life, have a solid work ethic and make their faith in God a priority. They taught what they lived…a spirit of faith and thankfulness…an enthusiasm for life that permeated throughout the community. Harold’s first job was shining shoes in the Altamont barbershops. Never afraid of hard work, he worked many hours in a bakery and sold insurance at night. He later worked for Homann Grain, ADM for many years. 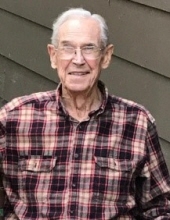 Always active in church and community, Harold served as congregational chairman, elder, secretary, and greeter and was a member in the choir at Immanuel Lutheran Church in Altamont. He also delivered Meals on Wheels, served as the committee chairman for the Boy Scouts of America and served on the Lakeland Advisory Board. He was a member of the community choir since it’s origin and was also a member of the FACE board of directors and choir. Harold served on the Altamont Building and Loan board as well as the Land of Lincoln Savings and Loan board. He was a mentor for the Big Brothers/Big Sisters program and helped build homes for Habitat for Humanity. He was an active member of the Altamont Lions Club for 65 years. The community appreciated all of these contributions and in 2001 Harold was awarded Citizen of the Year. He served in the US Army in Southeast Asia and Korea and was a member of the VFW, American Legion and participated in the first Honor Flight. Harold and Shirley taught dancing lessons for many years, took trips, played cards and lived life to the fullest. Harold was a man who loved to sing and dance. His life was like a song and a dance…sometimes it was two steps forward and one step back but every step reflected his strong and trusting faith in God. The Lord granted his last request that he would be surrounded by his family as he met his creator. His last words were a song of thankfulness and affirmation to those he knew and loved. Visitation will be at the Immanuel Lutheran Church in Altamont on Wednesday, April 18th from 5-8 pm and celebration of life on Thursday, April 19th at 11am at Immanuel. To send flowers or a remembrance gift to the family of Warren Harold Muchow, please visit our Tribute Store. Visitation hours will also be one hour prior to service. "Email Address" would like to share the life celebration of Warren Harold Muchow. Click on the "link" to go to share a favorite memory or leave a condolence message for the family.